25Enclosing an unused area brings a number of benefits to a household. Our patio enclosures, pergolas and gazebos provide the comforts of indoor living as they are insect proof and offer protection from the elements such as the wind or harsh sunlight. 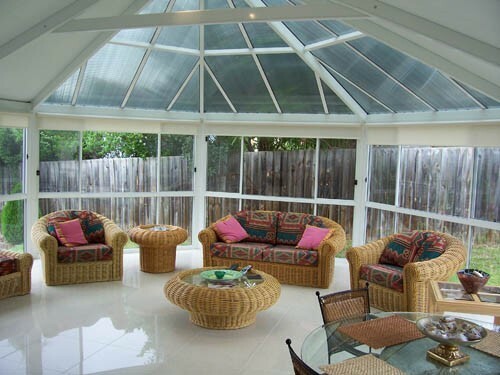 The patio enclosures, pergolas and gazebos we offer are suitable to act as a sun room, a play area for the kids, an entertaining area, a spare room or simply used for additional storage. Using the Shademaster insulated roofing panels , we can create your very own outdoor kitchen, keeping your family and friends comfortable while having the convenience of having all your entertaining needs in the one outdoor living area. If the installation requires fittings such as lights, we can easily install them into your new patio enclosure or gazebo. At a fraction of the cost of a conventional building, a Patioland sunroom is an ideal place to entertain or just unwind. With floor to ceiling glass windows it offers beautiful views and an abundance of light. With sturdy construction and flyscreens and key locks this product will give you the perfect protection for your family. Ask us today about a consultation and see how one of our patio enclosures and gazebos can enhance your living space. Call 02 9831 3899 or email us at info@patioland.com.au.